A smaller version of HTC’s flagship One M8 smartphone is in the pipeline and there’s photo evidence to prove it. The leaked image comes from well-known tipster @evleaks and reveals the One Mini M8 will arrive without the depth-sensing camera found on its bigger brother. Instead of the dual camera configuration, the smaller M8 will have just a single rear-facing camera and just one LED flash. This is in line with earlier rumors that suggested the M8 Mini would trade in the low-resolution 4-megapixel camera found on the larger phone for a 13-megapixel shooter. Everything else looks pretty spot-on in terms of design as the M8 Mini shares the same front-facing speaker layout and the rounded metal unibody chassis. The Twitter leaker also pointed to an earlier tweet that claims the M8 Mini will feature a 4.5-inch screen operating at 720p resolution, a 1.4GHz processor, 1GB of RAM and 16GB of internal storage. There’s also a microSD card slot for added expansion. That’s up from the original Mini which included a 4.3-inch display and a Qualcomm Snapdragon 400 SoC. 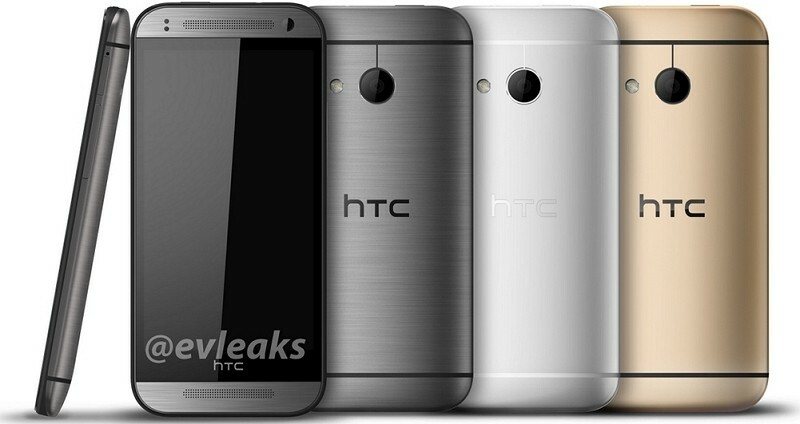 The handset will be available in silver, gold and gunmetal if the leaked image is to be believed. The original Mini, if you recall, was only available in silver. It’ll run Android 4.4 Kit Kit and use the Sense 6 interface. No word yet on when it’s expected to launch.